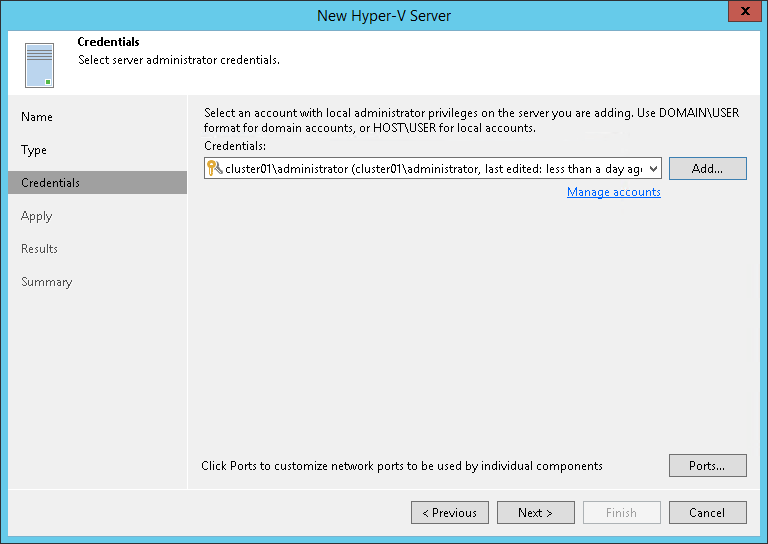 At the Credentials step of the wizard, specify credentials for the Microsoft Hyper-V server. From the Credentials list, select credentials for the account that has administrator privileges on the Microsoft Hyper-V server. If you have not set up credentials beforehand, click the Manage accounts link or click Add on the right to add the credentials. For more information, see Managing Credentials. If you are adding SCVMM, the same credentials will be applied to all Microsoft Hyper-V hosts managed by SCVMM. If some Microsoft Hyper-V hosts use their own credentials different from those you have provided, Veeam Backup & Replication will fail to deploy components on these hosts. You will have to specify credentials for such Microsoft Hyper-V hosts separately. After you connect SCVMM, expand it in the inventory pane to see the list of managed Microsoft Hyper-V hosts. Right-click the host, select Properties and use the Edit Hyper-V Server wizard to specify the credentials for this host. In the Data transfer options section of the Network Settings window, specify connection settings for file copy operations. Provide a range of ports that will be used as transmission channels between the source host and target host (one port per task). By default, Veeam Backup & Replication uses port range 2500-5000. If the virtual environment is not large and data traffic will not be significant, you can specify a smaller range of ports, for example, 2500-2510 to run 10 concurrent jobs at the same time. 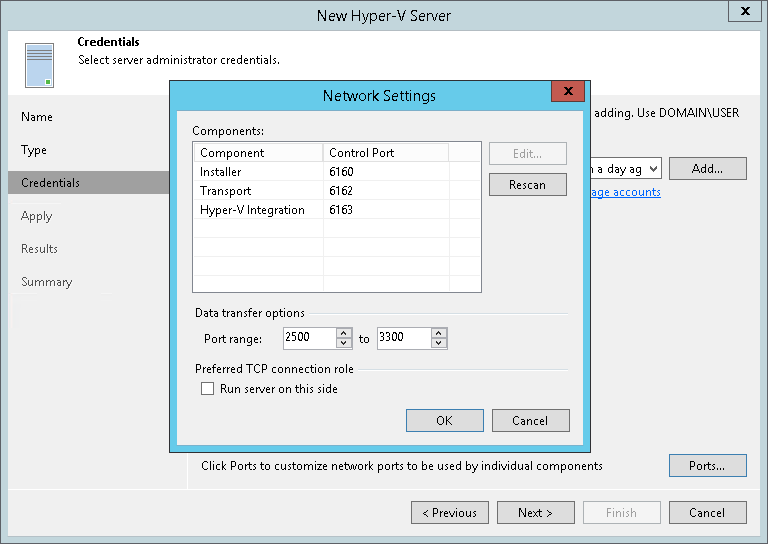 If the Microsoft Hyper-V host is deployed outside NAT, in the Preferred TCP connection role section select the Run server on this side check box. In the NAT scenario, the outside client cannot initiate a connection to the server on the NAT network. As a result, services that require initiation of the connection from outside can be disrupted. With this option selected, you will be able to overcome this limitation and initiate a ‘server-client’ connection — that is, a connection in the direction of the Microsoft Hyper-V host.